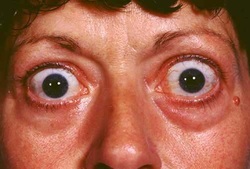 Thyroid storm is a severe life threatening acute cases of hyperthyroidism. The symptoms of thyroid storms are precipitated by trauma, labor, delivery, amiodarone, myocardial infarction, radio iodine therapy, diabetic ketoacidosis , thyroid surgery, surgery and infection. The symptoms of thyroid storms are vomiting, diarrhea, jaundice, acute abdominal pain, hepatic dysfunction, tachycardia, heart failure, atrial fibrillation, coma, agitation, psychosis, confusions, sweating and high fever. The investigations require are full blood count, urea and electrolytes, liver function test, free T4, blood glucose and thyroid function test. Patient should be treated in intensive care unit. Patient should be treated with antithyroid medication before any confirmation is made biochemically if thyroid storm is suspected. This is based on the fact that thyroid storm has a high degree of mortality if remain untreated. The treatment will initially focus on hyperthyroidism. Propylthiouracil (PTU) is considered. The loading dose is 600 mg stat and 900- 1200mg/day orally or through nasogastric tube in 4 - 6 divided doses. As an alternative carbimazole is considered. 60 -120 mg /day of carbimazole is considered in 3-4 divided doses orally or via nasogastric tube if patient unable orally to take the medication orally. Drugs can be suspended in liquid and given rectally. Propylthiouracil is considered more than carbimazole due to its ability to inhibit peripheral conversion of T4 to T3. The next step in treating hyperthyroidism is to inhibit the release of thyroid hormone. The medication involve include 1g/24hr IV sodium iodide by slow IV infusion or 100mg/6hr orally potassium iodide or 10 - 20 drops/ 8 hourly lugol iodine orally. It is vital to give the iodine one hour at least after the initial dose of carbimazole or propylthiouracil to avoid any uptake of iodine by the thyroid gland for further synthesis and release of thyroid hormone. Central venous pressure line is important in assessing the patient fluid status. Cautiously fluid replacement is given in case of dehydration. Hyperpyrexic patient is treated with paracetamol, tepid sponge and tan. Avoid any aspirin intake. Patient should be receiving subcutaneous heparin 5000 u 2 times daily. Low molecular weight heparin is given as prophylaxis against venous thrombo embolism. 2 mg/6 hr IV dexamethasone is given. Dexamethasone /steroid therapy is considered to inhibit the peripheral conversion of T4 to T3 and the release of thyroid hormone. Consider hemodialysis , peritoneal dialysis or exchange transfusion in patient who is unable to tolerate normal therapeutic treatment. Cardiac failure may occur with atrial fibrillation. Oxygen, diuretics and digoxin and propanolol are considered in case of uncontrolled atrial fibrillation with normal left ventricular function. Higher dose of digoxin is required to relative degree of resistance to digoxin due to decrease AV conduction or renal excretion. Acute arrhythmias can be control with parenteral amiodarone administration. We should wait for the patient to be euthyroid before considering any cardio version of atrial fibrillation.It is important to identify and treat precipitating factors. Beta blocker such as 1-2 mg propanolol IV 4- 6 hourly or oral propanolol 40 - 80 mg 6 hourly are considered in the absent of heart failure ( peripheral edema or pulmonary edema). It is important to assess the function of left ventricular before continuing treatment with beta blocker. In case of heart failure occur, consider treating with 0.4 - 1 mg IV atropine. In case of patient contraindicated for beta blocker ( chronic asthma) consider giving 60- 120 mg diltiazem 6 hourly orally. The short half life of IV esmolol is important as it allow rapid titration for difficult cases.